Safety Eyebolt Solutions The KEE I-BOLT range offers a comprehensive selection of Class A1 safety anchors. RINGANKA is a range of fixed Class A1 safety eyebolts and fixing components conforming to EN 795 and BS 7883. KEYANKA is a removable eyebolt and a range of fixing solutions, which is unobtrusive where visual presentation is important. It is important that the correct eyebolt is used to suit the material and that the positioning is determined by a competent person. Safety Eyebolt Ringanka A KEE SAFETY PRODUCT Features • Comprehensive range of anchor bolts and accessories to suit most installations • Available in Sheradised, White plastic coated and Stainless Steel • Conforms to CLASS A1 EN 795 1996, BS 7883 & ISO 14567 • CE Approved to PPE Directive Benefits • Provides workers with safe means of access • White plastic coated finish blends with most interior decor. 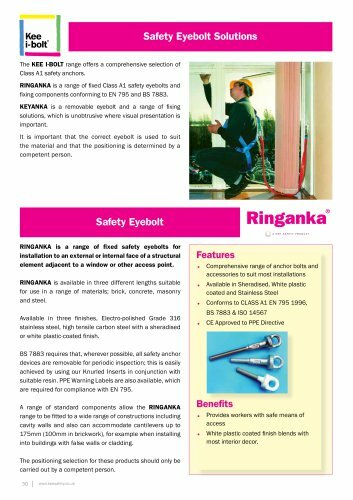 RINGANKA is a range of fixed safety eyebolts for installation to an external or internal face of a structural element adjacent to a window or other access point. RINGANKA is available in three different lengths suitable for use in a range of materials; brick, concrete, masonry and steel. Available in three finishes, Electro-polished Grade 316 stainless steel, high tensile carbon steel with a sheradised or white plastic-coated finish. BS 7883 requires that, wherever possible, all safety anchor devices are removable for periodic inspection; this is easily achieved by using our Knurled Inserts in conjunction with suitable resin. PPE Warning Labels are also available, which are required for compliance with EN 795. A range of standard components allow the RINGANKA range to be fitted to a wide range of constructions including cavity walls and also can accommodate cantilevers up to 175mm (100mm in brickwork), for example when installing into buildings with false walls or cladding. The positioning selection for these products should only be carried out by a competent person.